Good news, Conker fans! Microsoft has recently announced that everyone’s favorite filthy-mouthed, alcoholic squirrel will be coming back on the Xbox One and Windows 8!… within Project Spark… as an episodic game. Behold the forced and somewhat painful trailer below. Microsoft used Coker to promote Project Spark during E3 2014, so this doesn’t come as a huge surprise. The episodic adventure will be coming to Project Spark under the title, Conker’s Big Reunion. Episode 1 will be released on Xbox One and Windows 8 on April 23. Also, a DLC pack will be coming that will allow you to make your own games based around Conker. Let’s be honest, the trailer doesn’t look that great. Many fans are already up in arms about it. However, the trailer could be deceiving, and the game could be decent. 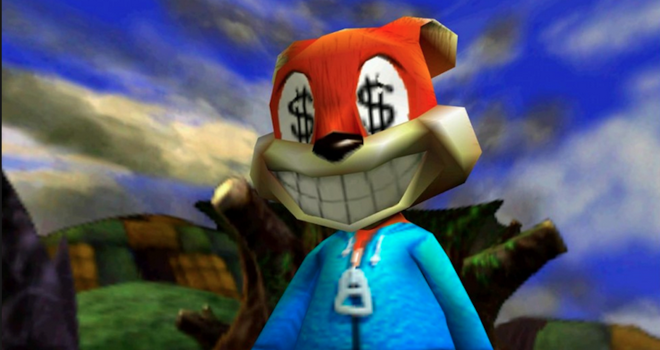 Let’s hope that it gets support, because it will show Microsoft that we want a brand new, full-fledged Conker game. At least Microsoft is testing the waters.